1. 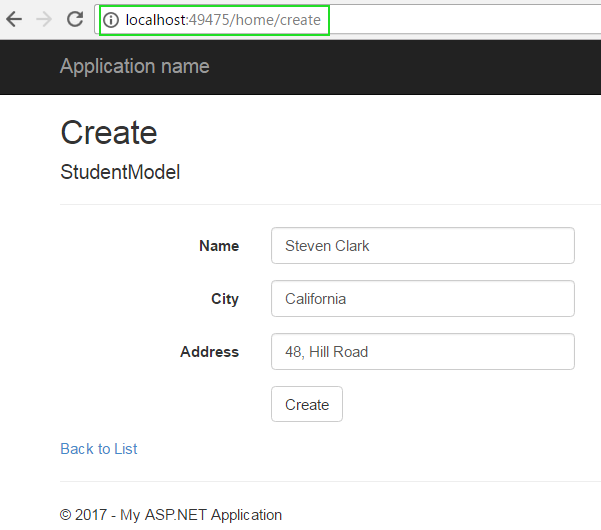 How to collect from value in Class in ASP.NET MVC 5 Project? 2. What are the different ways to Retrieve Form Values? 3. What is FormCollection Object, ModelBinder Class and UpdateModel Class? 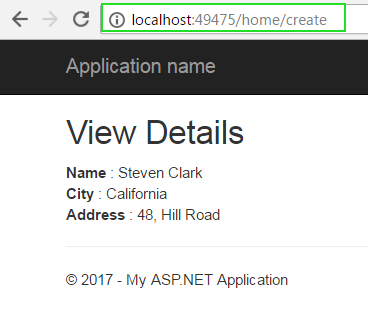 In this article, I am going to explain 4 different ways to Collect Form Data in Controller class in ASP.NET MVC 5. It is a very basic job for any application is to collect form data and process them with programming logic and save to the database. There are various ways to gather form value in class and I have added 4 most popular and suitable ways to do it. 1. 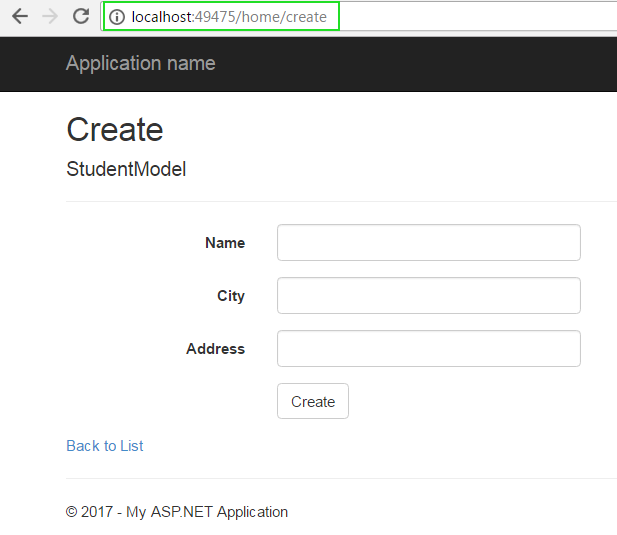 Create New ASP.NET MVC 5 Project and Add Controller, Models and Views. 2. Retrieve Form Data using FormCollection Object. 1. 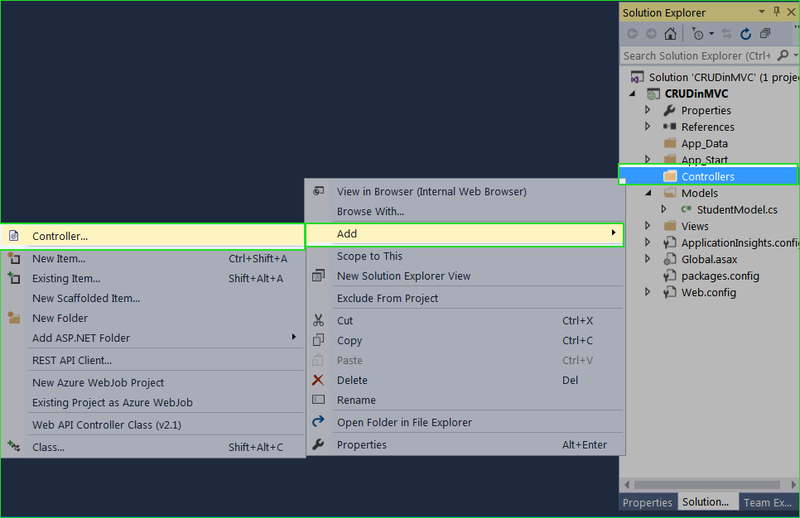 Create New MVC Project SaveFormData in Visual Studio 2013,2015 or 2017. Go to File New Project. 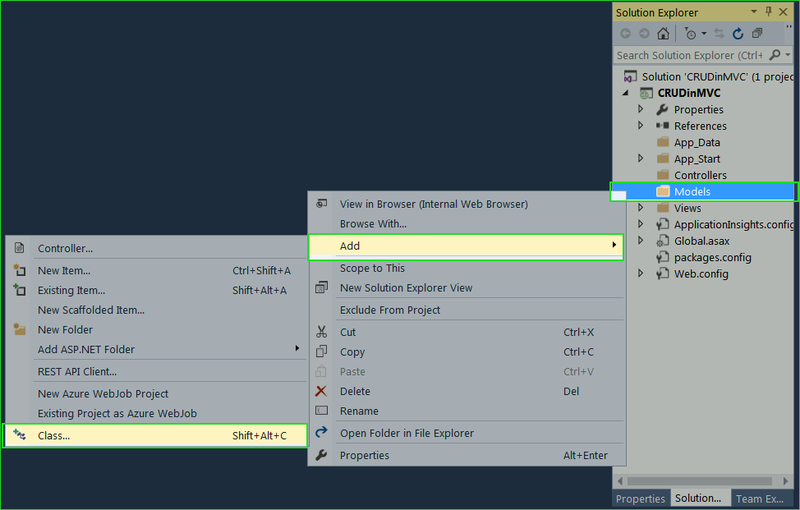 Select Web in left pane and then select ASP.NET Web Application (.Net Framework) in middle panel. A Template window will be opened. Select Empty Template and Check MVC CheckBox and click OK.
2. Create Model: Create a Model class StudentModel.cs. Right click on Models Folder Add Class. 3. Create Controller: Create a Controller HomeController.cs. Right click on Controllers Folder > Add > Controller. 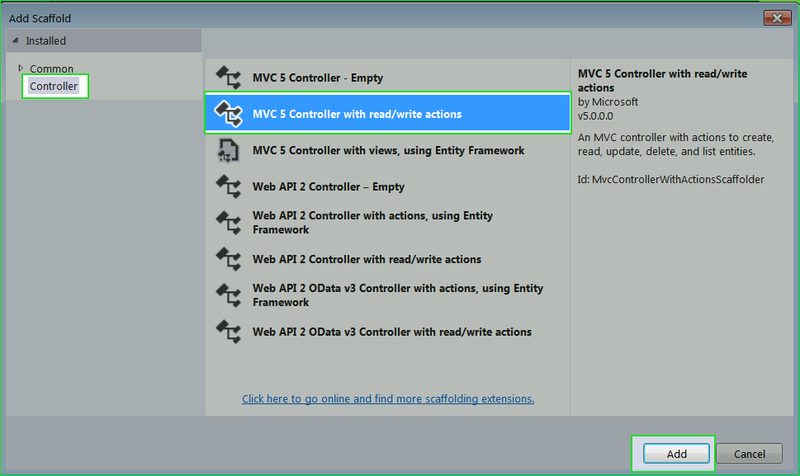 Select MVC 5 Controller with read/write actions. 4. Delete Unnecessary code and your HomeController.cs should look like this. However, it is not mandatory and you can use your own way to implement code. 5. Create Views: Right click on Create() Action Method in HomeController class and select Add View. Give View Name Create and then choose Create Template from dropdown list. Select StudentModel from Model Class dropdown list. Check Use a layout page and click Add. 6. Using same process create Index view Page. Right click on Index Action Method in HomeController class and click Add View. Give View Name: Index, Choose Template: Empty (Without Model), tick on Use a Layout Page and click on Add button. In this article, I will fill some data in Create Form and when click Create Button, it will display Index View Page with Filled data. Method 1. Retrieve Form Data using FormCollection Object. FormCollection object is used for accessing Form Data in controller class. The FormCollection Object automatically receives the posted form data. In the following example I am going to explain how to use FormCollection Object to retrieve form data into controller class. Method 2. 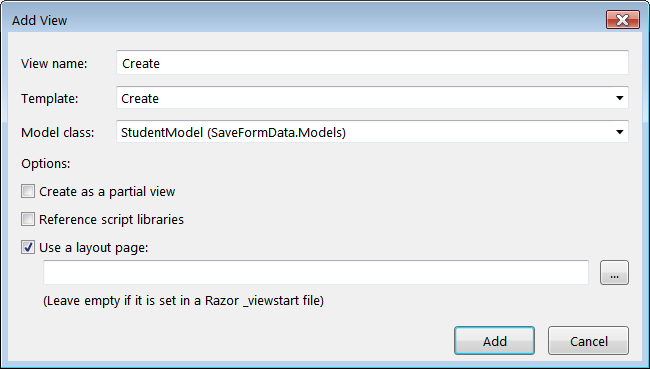 Retrieve Form Data using Model Binder - Using Parameter Type. I know what is going on your mind. You are thinking that how MVC map parameter exactly with correct components. It is very simple. 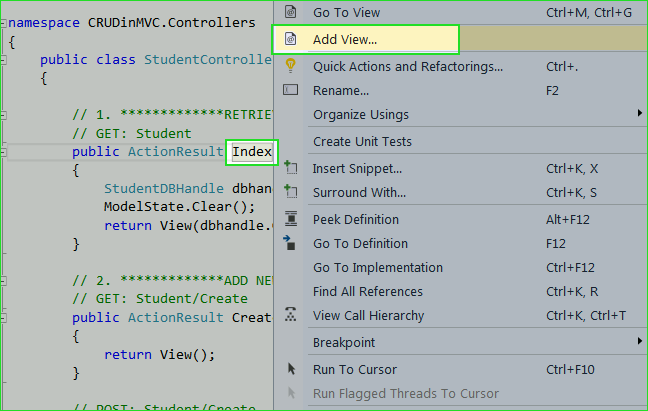 MVC has a Model Binder that does the following task to match parameter with control. b. Look for control name that match with parameter name. c. Map that control to parameter with same name. But here is a catch. You have to use the same name as your component name. If you look for Create.cshtml source page you will notice that the controls name are same as the parameter name. It doesn't matter ordering of parameter but naming should be same. In previous method, Model Binder works great if you have a form with 3 or 5 controls but what if you have a form with 30+ controls. It is not practical to use a 30+ parameter to retrieve form data. Your Model class fixes these issues and makes this job very easier. How see the example. In this example, you can receive data directly from your model class. 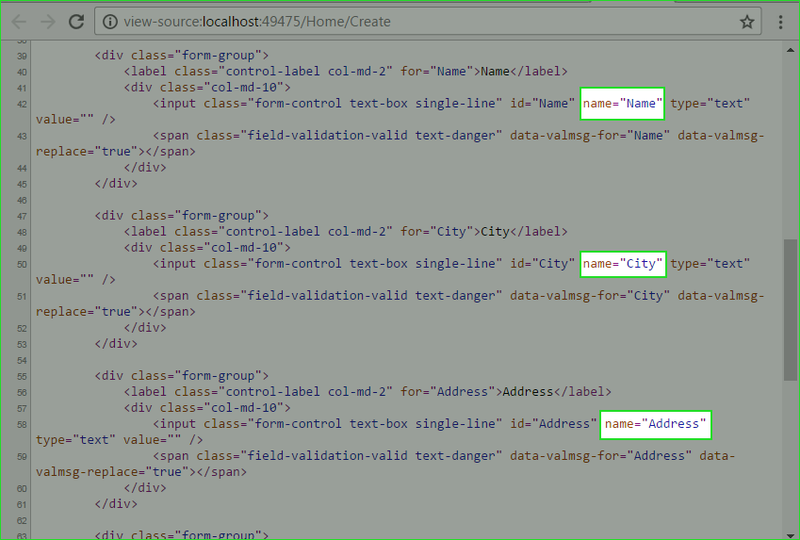 ModelState.IsValid properties ensure that all the data filled in a control was in a correct format and validated. In this article, I have shown you 4 different ways to retrieve form value in controller class. It is very necessary to know how to collect form data in a class for each MVC Programmer or learner. Hope, your doubt would be cleared.